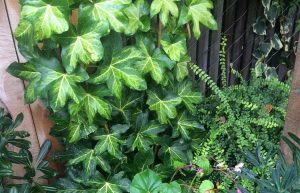 Hybrid between English Ivy and Fatsia that makes a fascinating decumbent evergreen shrub for part shade to shade. May be diligently trained as a bold evergreen vine. Large glossy green leaves with a center of gold are striking year round. To 9′ tall as a trained vine or as wide as a decumbent shrub on the ground. Takes drought when established. Small off white orbicular flowers in autumn. Sterile. Good deer resistance.